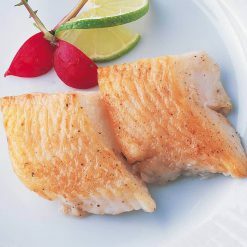 Fresh righteye flounder with fat, cut into easily-usable slices. Can be used in various types of dishes, including fried, boiled, and à la meunière. Each package is 200g (4 slices) and arrives frozen. This halibut with fat was caught in the cold seas of Greenland and comes with skin and bones removed for easy preparation. Process: After being caught in Greenland, the halibut’s head and organs are removed and it is frozen. It is then brought to China, where it is filleted and sliced. Then, lastly, it is brought to Japan and packaged in bags of four. Sugarlady’s seafood is caught in season and processed right away, ensuring that you always receive the highest possible freshness and flavor. Because this halibut comes sliced and ready to use, the amount of time you need to set aside for preparing fish dishes can be drastically reduced. In addition, because the fish comes frozen, it is easy to have plenty of it on hand at any time without worrying about it spoiling. Sugarlady’s seafood and other frozen products allow you to cook meals from all sorts of real, nutritious ingredients whenever you desire, even on the busiest of days! 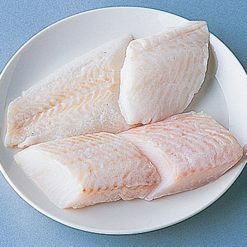 How to defrost: Simply defrost in the refrigerator.How to eat: This halibut can be cooked in a variety of ways, including frying, boiling, or à la meunière. Meunière is popular in New Orleans in America, and involves coating the fish in a flour mixture and then sautéing or frying it. This product contains greenland halibut (Denmark).. Origin of ingredients: Greenland halibut (North Atlantic). Prepared and packaged in China.